"An unstoppable threat. An unthinkable sacrifice." 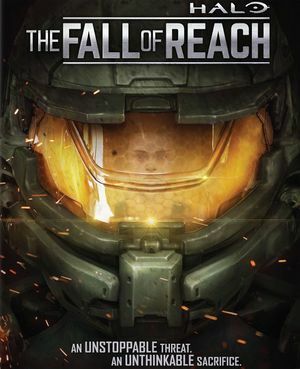 Halo: The Fall of Reach – The Animated Series is an animated series adapted from the novel of the same name by Eric Nylund. The series was created by Sequence in conjunction with 343 Industries. Comprising three acts, the series is featured in the Limited Edition and Limited Collector's Edition of Halo 5: Guardians. It was made available in its entirety upon the game's release (as opposed to having weekly airing dates like Halo: Nightfall). The series was released on Blu-ray and DVD on December 1, 2015. Halo: The Fall of Reach – The Animated Series was created and directed by Sequence, along with 343 Industries. The hour-long adaptation was released on October 27, 2015, with the Limited Edition and Limited Collector's Edition of Halo 5: Guardians. The series is intended to serve as a way for fans to learn the origins of John-117, Blue Team, and the SPARTAN-II program. One of the goals of the project was to bring new life to the backstory of the Master Chief and his Spartan brethren. Halo: The Fall of Reach – The Animated Series features audio, sound, and visual effects from the Halo series. 343 Industries' Franchise Development Director Frank O'Connor has stated that the series carefully aligns itself with the novel, but takes artistic liberties with certain design choices—such as choice of Covenant ships or weapons. The series has been said to tightly adhere to the novel with some additions to help "fill in gaps or smooth over previous errors". One of the main challenges of the adaptation was the decision to drop characters' inner monologues from the novel, while fitting the novel's contents into an hour also proved difficult. As a result, the animated series only encompasses the first half of the novel (Sections I and II), with the battles of Sigma Octanus IV and Reach being omitted entirely. The most significant changes from the novel are listed here. The series features minor connections to Halo 5: Guardians, which O'Connor claims are "a subtle nod only book readers will even notice". Halo: The Fall of Reach – The Animated Series shares artistic similarities with other works created by Sequence, such as the Terminals for Halo: Combat Evolved Anniversary, Halo 4, and Halo 2: Anniversary. However, the scale and fidelity of the animation is noted to be more ambitious, fully animated, and largely 3D, unlike Sequence's previous Halo projects. A trailer for the series was released on July 10, 2015. The soundtrack for Halo: The Fall of Reach - The Animated Series was composed by Tom Salta, who also worked on the soundtracks for Halo: Spartan Assault and Halo: Spartan Strike. The animated film was not a direct adaptation of the full book, adapting the first two-thirds and ending with the death of Samuel-034. The most notable omission is the titular Fall of Reach; the film ends with the Battle of Chi Ceti and only flashes to the glassed Reach in the bookend scenes. Greater emphasis is placed on the Blue Team that comprises John-117's team in Guardians, therefore increasing the roles of Frederic-104 and Linda-058. Fred and Linda join Kelly-087, Sam and John in their initial teamwork training session. In the Battle of Chi Ceti, rather than all of the Spartans launching and only Kelly, Sam and John making it, only Blue Team launches and all five make it aboard the Covenant ship. During the Battle of Chi Ceti, the Spartans use a HAVOK tactical nuclear weapon taken from one of the UNSC Commonwealth's Pelicans to destroy the Unrelenting. In the novel, they use warheads from Anvil II missiles while the Pelicans did not carry nuclear weapons. Additionally, the Unrelenting is depicted as a CCS-class battlecruiser while the novel shows it as being around the size of the Commonwealth, a Paris-class heavy frigate. As well, the Commonwealth itself is depicted as a Charon-class light frigate instead of the canonical Paris class. The tree-carving scene does not take place in the book, rather the children head directly to a single rendezvous together. The winners of Hunt the Signal got their likeness put in the animation. An alternate version of the concept art. Keyes in the cryo chamber aboard Han. Spartan recruits gather in a briefing chamber. Spartan recruits eating in a mess hall. UNSC Atlas in the Lambda Serpentis system. John-117 after fighting several ODSTs. Laden in the Eridanus system. Blue Team approaching the Unrelenting. Blue Team returning to the glassed surface of Reach. John-117, Samuel-034 and Kelly-087 aboard the Unrelenting.